As part of my monitoring process, I review the list of dividend increases every week. I usually focus on companies that have managed to boost dividends to shareholders for at least a decade. It looks like this year may be classified as the year of higher dividend growth. This is because of the new tax law, which went into effect this year. As a result of the lowering of corporate tax rates, companies are increasing the amounts of their regular dividends to shareholders, and are initiating new share buyback programs. Some companies are accelerating their dividend increases schedules, and therefore showering their shareholders with more cash. As shareholders in many prominent blue chips, we can hardly complain of course. The Sherwin-Williams Company (SHW) develops, manufactures, distributes, and sells paints, coatings, and related products to professional, industrial, commercial, and retail customers primarily in North and South America, the Caribbean, Europe, and Asia. The company operates in four segments: Paint Stores Group, Consumer Group, Global Finishes Group, and Latin America Coatings Group. The company raised its quarterly dividend by 1.20% to 86 cents/share. This is the third dividend increase in a row of a penny per share. This increase follows 39 consecutive years of dividend increases for this dividend aristocrat. The company is prioritizing debt repayment over high dividend hikes, which seems prudent. The company has managed to hike its annual dividends at a rate of 10.40%/year over the past decade. The stock yields 0.90%. The company managed to grow its earnings per share from $4.70/share in 2007 to $15.07/share in 2017. Currently, the stock is overvalued at 26 times earnings and yields 0.90%. I would be interested in Sherwin-Williams on dips below $300/share. The Coca-Cola Company (KO) is a beverage company that manufactures and distributes various nonalcoholic beverages worldwide. Coca-Cola raised its quarterly dividend by 5.40% to 39 cents/share. This marked the 56th consecutive annual dividend increase for this dividend king. Coca-Cola has managed to hike its dividends at an annual rate of 7.90%/year over the past decade. Unfortunately, the company has been unable to grow earnings per share over the past decade. Coca-Cola earned $1.28/share in 2007. Last year, in FY 2017, Coca-Cola only earned $1.10/share. The company does expect to earn $2.06 - $2.10/share in 2018. However, the forward expectations for near term earnings have been at around $2/share for several years in a row now. As a result, I view the stock as overvalued at 21.80 times forward earnings. While Coke yields a nice 3.50% today, I view the forward dividend payout ratio at 75% to be a tad too high. Consistent with my analysis from last year, I view Coca-Cola as a hold. I would not be buying shares today, if I were just starting out. AbbVie Inc. (ABBV) discovers, develops, manufactures, and sells pharmaceutical products worldwide. The company hiked its quarterly dividend by 35% to 96 cents/share. The company has increased dividends by 140% since it split from Abbott Laboratories (ABT) in 2013. Between 2013 and 2017, Abbvie grew its earnings per share by 43% to $3.70/share.The company expects to further grow its earnings per share to $6.45 - $6.55/share in 2018. AbbVie is fairly valued at 18.40 times forward earnings and yields 3.20%. The Clorox Company (CLX) manufactures and markets consumer and professional products worldwide. It operates through four segments: Cleaning, Household, Lifestyle, and International. Clorox hiked its dividend by 14% to 96 cents/share. This is an accelerated declaration of the company's dividend increase, which typically takes place in the month of May. Annual dividends paid to shareholders of this dividend aristocrat have increased each year since 1977. 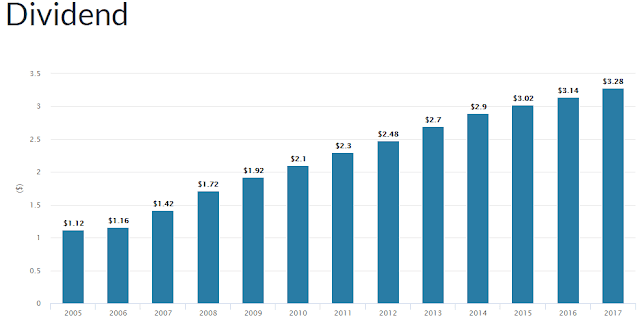 Clorox has managed to hike its dividends at an annual rate of 8%/year over the past decade. The stock yields 2.90%. The dividend payout ratio is a little high at 71.90% today, it is adequate at 61.50% using forward earnings estimates of $6.24/share. The company has managed to grow earnings per share from $3.24 in 2008 to $5.34 in 2017. Unfortunately, the stock is a little overvalued at 24.70 times earnings. Clorox shares may be worth a look on dips below $107/share. PepsiCo, Inc. (PEP) operates as a food and beverage company worldwide. PepsiCo hiked its quarterly dividend by 15% to $0.9275/share. This is the 46th consecutive dividend increase for this dividend aristocrat. PepsiCo has managed to hike its dividends at an annual rate of 8.90%/year over the past decade. The company grew its earnings per share between 2008 and 2017 from $3.21/share to $5.08/share. The stock is a little overvalued at 21.90 times earnings. It may be worth another look on dips below $100/share. PepsiCo yields 3.30%, but the dividend payout ratio comes out to 73% today, which is higher than I would want it to be. Using forward earnings however, the dividend payout ratio is more sustainable at 65%. T. Rowe Price Group, Inc. (TROW) is a publicly owned investment manager. The firm provides its services to individuals, institutional investors, retirement plans, financial intermediaries, and institutions. T. Rowe Price Group, Inc. hiked its quarterly dividend by 23% to $0.70 per share. This marks the 32nd consecutive year that the company has increased its regular annual dividend. The company has managed to increase its dividends at an annual rate of 12.90%/year over the past decade. The stock yields 2.60%, and has an adequately covered dividend. Dividend growth has been supported by a solid growth in earnings per share from $2.40 in 2007 to $5.97/share in 2017. The stock is fairly valued at 18.50 times earnings today. NextEra Energy, Inc. (NEE), through its subsidiaries, generates, transmits, and distributes electric power to retail and wholesale customers in North America. The company generates electricity through wind, solar, nuclear, and natural gas-fired facilities. NextEra Energy today declared a regular quarterly common stock dividend of $1.11 per share, up approximately 13 percent versus the prior-year comparable quarterly dividend. This marked the 24th consecutive annual dividend increase for this dividend achiever. Over the past decade, it has managed to grow its dividends at a rate of 9.10%/year. The company expected to translate to a growth rate in dividends per share of 12 to 14 percent per year through at least 2020. The stock yields 2.90% today, and has an adequately covered dividend. 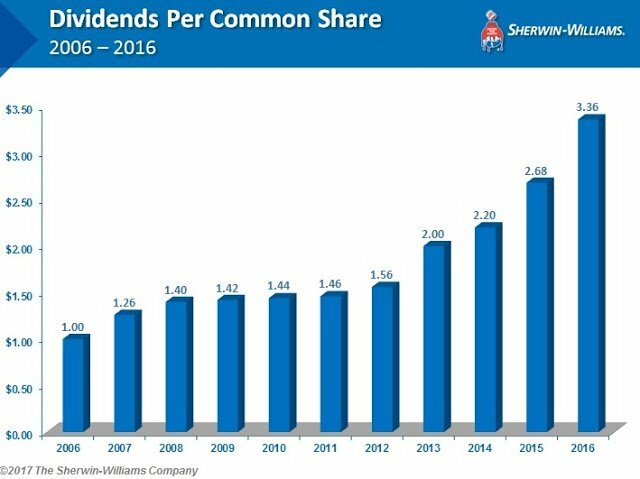 Dividend growth has been supported by a solid growth in earnings per share from $3.27 in 2007 to $6.70/share in 2017. Unfortunately, this stock is overvalued at 23.30 times earnings today. It may be worth a second look on dips below $134/share. CSX Corporation (CSX), together with its subsidiaries, provides rail-based transportation services in the United States and Canada. The company hiked its quarterly dividend by 10% to 22 cents/share. This marked the 14th year of annual dividend increases for this dividend achiever. Over the past decade, it has managed to hike its distributions at an annual rate of 15.80%/year. The stock yields 1.60%. The company managed to grow its earnings from $1.11/share in 2008 to $2.15/share in 2017.The stock is overvalued today at 26.10 times earnings. Using forward earnings estimates for 2018 at $3.11/share, it looks fairly valued at 18 times forward earnings. CSX may be worth a second look below $43/share. The Dun & Bradstreet Corporation (DNB) provides commercial data, analytics, and insights on businesses worldwide.The company raised its quarterly distribution by 4% to 52.25 cents/share. This marked the 12th year of annual dividend increases for Dun & Bradstreet. Over the past decade, the company has been able to hike its dividends at an annual rate of 7.20%/year. The stock yields 1.70%. The company grew its earnings from $4.99/share in 2007 to $6.18/share in 2017. At this time I am giving the company a pass, as it seems to be growing earnings slowly, and it is close to fully valued at 19.60 times earnings. L3 Technologies, Inc. (LLL) provides aerospace systems, and communication and electronic systems and products used on military and commercial platforms in the United States and internationally. The company operates in three segments: Electronic Systems, Aerospace Systems, and Communication Systems. The company hiked its quarterly dividend by 6.70% to 80 cents/share. This marked the 15th consecutive annual dividend increase for this dividend achiever. Over the past decade, L3 Technologies has managed to hike its annual dividend at a rate of 12.10%/year. The stock yields 1.60%. While the company has been able to grow earnings per share a bit over the past decade, this was achieved mostly through financial engineering - meaning share buybacks. Given the fact that valuations today are higher, it means that the impact of future share buybacks will be subdued at best. Given the fact that the stock is selling above 20 times earnings, I view it as a hold. Ryder System, Inc. (R) provides transportation and supply chain management solutions to small businesses and large enterprises worldwide. The company operates through three segments: Fleet Management Solutions, Dedicated Transportation Solutions, and Supply Chain Solutions. The company managed to hike its quarterly dividend by 13% to 52 cents/share, which is higher than the ten year average of 7.90%/year. This marked the 14th consecutive annual dividend increase for this dividend achiever. The stock yields 2.50%. The company was unable to grow earnings significantly over the past decade, as they went from $4.24/share in 2007 to $4.53 in 2017. While the stock seems attractively valued on the surface at 16.90 times earnings and a dividend yield of 2.50%, the lack of earnings growth makes it a pass for me at this time. Jack Henry & Associates, Inc. (JKHY) provides technology solutions and payment processing services primarily for financial services organizations in the United States. The company higher its annual dividend by 19.40% to 37 cents/share, which is a little higher than the average annual increase over the past decade of 16.90%/year. This marked the 28th annual dividend increase for this dividend champion, The stock yields 1.30%. The company grew its earnings from $1.16/share in 2008 to $3.14/share in 2017. Unfortunately, the stock is overvalued at 38 times earnings today. If the company is ever available below $70/share, which is equivalent to 20 times forward earnings, it may be worth a second look.